Colombians spurned the chance to curb rampant corruption. Here's why. The recent arrest of Colombia’s own corruption tsar on bribery charges laid bare the gravity of a problem that President Iván Duque has dubbed a “cancer." MEDELLÍN, Colombia — On paper, it looked a no-brainer, a gilt-edged chance for Colombians to vent their anger against their notoriously unscrupulous lawmakers. But in a nationwide anti-corruption referendum on Sunday that sought to curb flagrant abuses of government power, more than two-thirds of registered voters, some 25 million people, didn't cast a ballot, so the vote was declared void. The outcome was not altogether unexpected. Apathy, voter fatigue — presidential elections were held just two months ago — and the influence of powerful politicians hostile to the referendum, notably former president Álvaro Uribe, were decisive, according to experts. “If it’s not a presidential election, the Colombians just don’t vote en masse,” said Kyle Johnson, senior analyst for Colombia at the International Crisis Group. The referendum, the result of a two-year campaign by Colombia’s Green Alliance Party, had called for cuts to politicians’ salaries, greater transparency in public contracts, an end to house arrest for those found guilty of wrongdoing and three-term limits for elected officials. Colombians were asked to respond “yes” or “no” to seven separate questions. Congress would have had one year to implement the measures, had the vote been valid. Those who did vote overwhelmingly backed the bill — each proposal received almost 100 percent approval. Just under 11.7 million Colombians turned out, falling short of the 12.1 million votes that had been required to make it binding. “It feels bad to lose, with the result so close,” said 34-year-old graphic designer Isabel Meija, who voted in favor of the measures. Corruption is rife in Colombia, costing the country an estimated $14 billion a year. Fresh legislation to tackle the problem and the launch of a special anti-graft unit have made little impact. Duque, who took office earlier this month, has repeatedly promised to tackle government graft and had encouraged voters to participate in Sunday’s referendum. Outside a polling station on Sunday morning in Medellín, Colombia’s second largest city, voters in favor of the proposals were strong on the ground. “I think the referendum is so important, they have to show us where all this money is going, and how they’re spending it, because in truth, they are stealing so much,” said 25-year-old nursing assistant Deborah Mosquera. Although most of the major political parties had backed the bill, little effort was made to promote it, while mainstream media coverage was minimal. None of Colombia’s main terrestrial TV channels covered the results as they broke on Sunday afternoon. Fake news attempted to sway voters, with claims that approval would lead to a cut in the minimum salary and that Green Alliance member Claudia López, who spearheaded the referendum campaign, would receive money in return for every “yes” vote. In a last ditch effort to galvanize voters, Green Alliance members, led by López, had released a parody reggaeton video, notching over two million views. Despite Sunday’s result, Colombians may be surprised that a citizen-backed referendum attracted over 11 million votes in a country with one of the highest abstention rates in the region. Proponents claim the vote was proof that Colombians are sick of the behavior of some of their elected officials, who should be held to greater account for their actions. 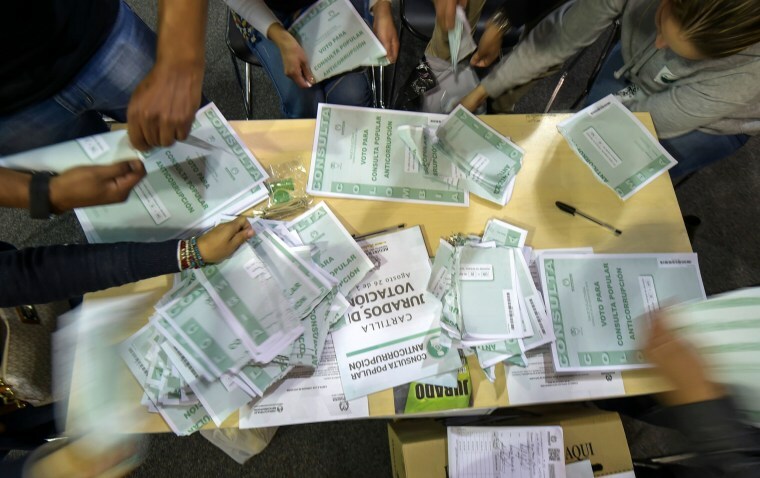 “The fact that it got more votes than the sitting president indicates that many don’t want politics to continue as usual, and see the political system in need of reforms,” said Gimena Sánchez-Garzoli, a rights advocate at the Washington Office on Latin America. Mauricio Londoño Gallego, 49, a social communicator from Medellín, was upbeat about the future of political participation in Colombia. “This referendum will serve as a model for the future,” he said.